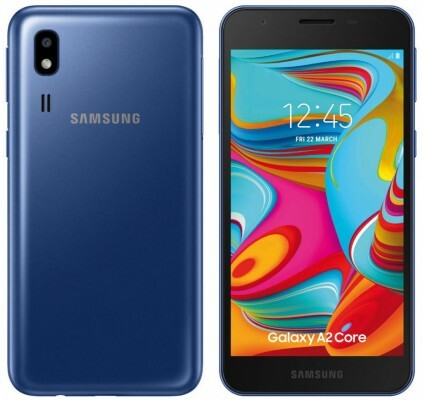 The Samsung Galaxy A2 Core is nearing launch day and the latest set of rumors confirm the specs we saw a while ago and add a price tag to the picture. This Android Go edition phone will launch in India at INR 5,300 (that’s around $76/€68). This is lower than the Galaxy J2 Core, Samsung’s first Go edition phone, which launched at INR 6,000 and was later discounted to INR 5,500. The Galaxy A2 Core will have a plastic build and a small screen – a 5” LCD with qHD resolution. It’s not small on absolute terms, but it is about as small as modern smartphones get. It will run Android 9 Pie Go edition on an Exynos 7870 chipset with 1GB of RAM and 16GB storage (likely expandable). All of this will be powered by a 2,600mAh battery. The selfie camera (which was previously unknown) will match the resolution of the rear cam – 5MP. 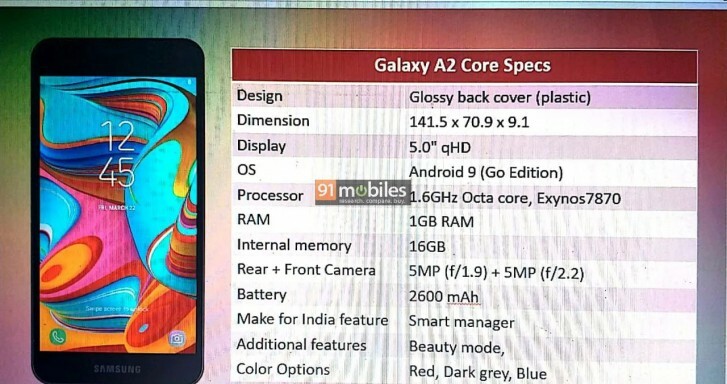 The exact launch date of the Galaxy A2 Core is not known yet but it should be fairly soon. The phone will be available in Red, Blue and Dark Gray. Better go for the Nokia 1.